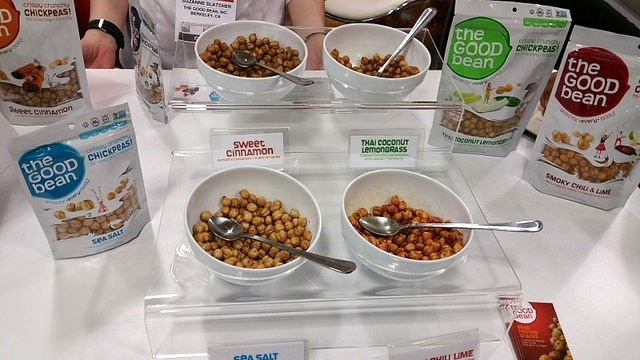 The Good Bean: Started in 2010, founders Sarah Wallace and Suzanne Slatcher were the first to market these all-natural roasted chickpea snacks. Chickpeas are high in protein and fiber and low in fat, but they are also nut-free and gluten-free, so they can be enjoyed by all. With flavors like sea salt, smoky chili lime, sweet cinnamon, Thai coconut lemongrass, cracked pepper, chocolate, and mesquite barbecue, these beans are crispy and crunch like chips but have as much protein as almonds and as much fiber as broccoli. The Good Bean has also launched bean chips, a protein blend of chickpea, navy bean and red lentils, that is closer in texture and taste to corn chips. SeaSnax: Seaweed is considered a very healthy food as it is rich in minerals such as iodine, calcium, sodium, magnesium, potassium, iron, zinc, copper and selenium. Seaweed as a snack has been popular for the last few years with sheets of nori, as well as strips, available at local markets. But the quality of SeaSnax is one of the better ones on the market. Using organic seaweed that is sustainably harvested, roasted, and packaged in Korea, the Stix, seaweed strips, and the Chomperz — seaweed chips wrapped in rice — are crispier, crunchier, and have more flavor than other brands on the market. SuperSeedz: These gourmet pumpkin seeds come in flavors like maple sugar and sea salt, cinnamon and sugar, tomato Italiano, sea salt, and more. Larger than a sunflower seed, pumpkin seeds have more protein than almonds, more iron than peanuts, and more magnesium than sunflower seeds. SuperSeedz are a plant-based protein and are allergen-free, cholesterol-free, trans-fat free, and non-GMO verified. The Art of Caramel: It is hard not to like caramel popcorn, but most are made with corn syrup which does not make it the healthiest sweet snack. That is, until now. Los Angeles-based couple Keiko and Rob Feldman, who both worked at NBC News before starting a video production company, created The Art of Caramel after making it at home as gifts for clients. Using tapioca syrup instead of corn syrup, the popcorn is all made by hand and there are currently four flavors: Kentucky Bourbon Black Ppepper, Bananas Foster with Dark Rum, Mayan Chile Chocolate, Brandy Spiked Egg Nog, Orange Cognac Kiss (Grand Marnier with chocolate), and Vanilla Bean Cocoa Nib, in which they split the vanilla beans. Salty Road: Brooklyn-based founder Marisa Wu was looking to start her own business, so she interned for a variety of other businesses including a butcher, a baker, and a candy maker. With Salty Road, she puts her own spin on classic salt water taffy. Using natural flavorings like vanilla beans, fruit purees, spices, and large-grain sea salt, the taffy is more like flavored nougat with a distinct salt crystal crunch than the fake-flavored candy you find at any boardwalk. Bandar Foods: Co-founder Dan Garblik went to an Indian restaurant in Philadelphia and when he asked for hot sauce, he was given Tabasco. Friend and Co-Founder Lalit Kalani explained that the spice in Indian food comes from the chutneys. Together, they created Bandar Foods three years ago, offering Indian flavors for American tastes. Chutneys are packaged into a recognizable format — condiment containers — for Americans, which allow these Indian flavors to be squeezed on top of everyday food. Bandar Foods also produces snacks like poppadums, vegetable chips, and naan chips in flavors like tikka masala, cumin, garlic, and more. Wei Kitchen: Bringing Vietnamese flavors to everyday cooking, Wei Kitchen produces shallot oil and amber vinegar in both normal and spicy flavors, as well as shallot crisps. These products make cooking Asian dishes at home easier. They also offer cold-brew Vietnamese coffee, black and sweet. Life Basics Organics: Focused on health and wellness, Life Basics Organics offers a line of iced teas that are inspired by flavors of the world. All ingredients are sourced from organic growers and suppliers, and they travel around the world to meet with their growers. Flavors include the Original Brazilian Tea of yerba mate, the Original Indian Team of masala chai, the Royal Persian Tea with organic turmeric, and the Original Turkish Tea with pomegranate. Nona Lim: Inspired by Singaporean street food, Nona Lim combines the flavors of the East with the clean ingredients of California in broths, soups, and packaged noodles. The soups, such as carrot ginger, Thai green curry, and kale potato, and broths, such as Vietnamese pho, miso ramen, and Thai curry and lime, are homemade using whole vegetables and real spices and no preservatives. World Soups: Unlike many store-bought soups where you have to empty the packets and add water and heat, World Soups are 32-ounce bowls that come with a pouch of broth and a pouch of noodles. Add both to the bowl and heat and it is possible to enjoy soup flavors from around the world with a product that does not use any preservatives, artificial flavors, or MSG. Chirps: Some say that insect protein is the next big thing, and Chirps is trying to make bugs friendly. Using cricket flour, Chirps chips are healthy, sustainable, and gluten-free. Co-Founder Laura D'Asaro transitioned from vegetarian to “ectoterian” after trying bugs when traveling in Africa and says that crickets are an ethical alternate protein. Don Bugito: This 4-year-old company offers whole insects as a snack. Inspired by Mexican, pre-Hispanic, and Native American cuisine, edible insects are popular in many cultures around the world. Don Bugito is reviving old traditions with chili lime crickets and pumpkin seeds, salted chocolate crickets, spicy bugitos made with superworms, toffee coconut bugitos made with mealworms and chocolate covered superworms.